1) It can be fitted to the bottom of the top half of a stable door in order to deflect rain from the bottom half of the stable door. 2) It can be fitted to the head of an opening outward door frame to deflect the rain from the top of the door. The cross section of this item is 45mm x 20mm, the rebate in the back is 15x12 making the front section 30mm deep. 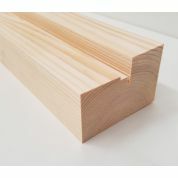 The timber is Idigbo, a light coloured hardwood.